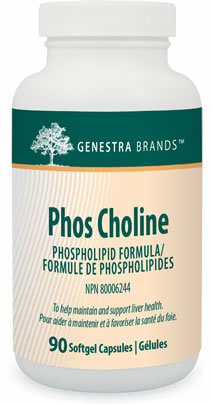 Phos Choline provides a highly absorbable source of phosphatidylcholine, derived from unbleached soya lecithin, needed for proper liver and brain functions. Unbleached soya lecithin yields three times more phosphatidylcholine than sources found in wheat germ, egg and brewer?s yeast. Phosphatidylcholine protects the liver against the side-effects of alcoholism, viruses, pollutants and other toxic influences, and assists in lowering elevated cholesterol levels. Phos Choline is indicated for arteriosclerosis and arterial plaque; and for manic depression, memory loss, Alzheimer?s disease, dementia, multiple sclerosis, attention deficit disorder, autism and Tourette?s syndrome. The soya used is GMO free. Guaranteed to contain no added wheat, yeast, gluten, corn, salt, sugar, artificial coloring or flavoring, preservatives or dairy products.